Beautifully engraved certificate from the Buffalo Bill's Wild West and Pawnee Bill's Great Far East Combined issued in 1912. This historic document has an ornate border around it with a vignette of an eagle perched upon a rock with its wings spread. This certificate is # 3 and was issued to Henry M. Stratton. This item is hand signed by the company�s officers including the President, Gordon W. Lillie ...Pawnee Bill and the company's Treasurer, Charles Metius. This historic item is over 89 years old. I sent a copy of this certificate to the Buffalo Bill Museum / Buffalo Bill Historical Center in Cody, Wyoming. They found 3 similar stock certificates. #2 was issued to Charles Metius; #4 to William F. Cody; and #5 to Gordon W. Lillie. They did not know who was issued certificate #1. 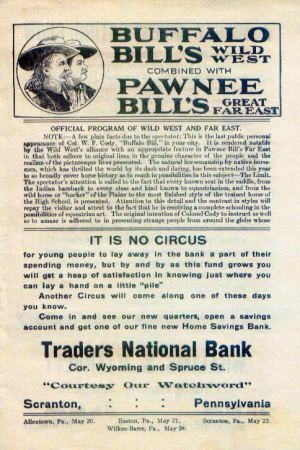 In 1908, Pawnee Bill merged his Wild West Show with the Buffalo Bill Wild West Show and the combined show became know as "Buffalo Bill's Wild West and Pawnee Bill's Great Far East Show Combined." William F. "Buffalo Bill" Cody was born in LeClaire, Iowa in 1846. While he was still a child, his family moved to Leavenworth, Kansas. Cody left his home in Leavenworth, Kansas, at the young age of eleven. He herded cattle and worked as a driver on a wagon train, crossing the Great Plains several times. He went on to fur trapping and gold mining, then joined the Pony Express in 1860. After the Civil War, Cody scouted for the Army and gained the nickname "Buffalo Bill" as a hunter. Cody�s life in the West offered the stuff from which legends were made and he soon was popularized in newspaper accounts and dime novels. Buffalo Bill�s show business career began on December 17, 1872 in Chicago; he was age twenty-six. "The Scouts of the Prairie" was a drama created by dime novelist Ned Buntline, who appeared in it with Cody and another well-known scout, "Texas Jack" Omohundro. The show was a success, despite one critic�s characterization of Cody as "a good-looking fellow, tall and straight as an arrow, but ridiculous as an actor." Other critics noted Cody�s manner of charming the audience and the realism he brought to his performance. Actor or not, Buffalo Bill was a showman. The following season Cody organized his own troupe, the Buffalo Bill Combination. The troupe� show "Scouts of the Plains" included Buffalo Bill, Texas Jack, and Cody�s old friend "Wild Bill" Hickok. Wild Bill and Texas Jack eventually left the show, but Cody continued staging a variety of plays until 1882. That year the Wild West show was conceived. It was an outdoor spectacle, designed to both educate and entertain, using a cast of hundreds as well as live buffalo, elk, cattle, and other animals. 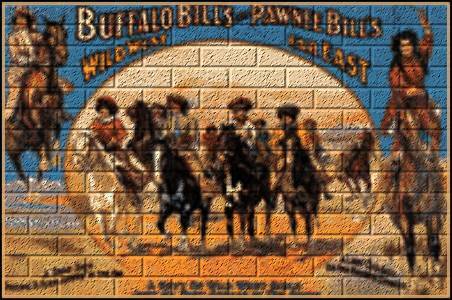 "Buffalo Bill�s Wild West" used real cow-boys and cow-girls, recruited from ranches in the West. At first, few people shared Cody's admiration of the cow-boys. Most people regarded them as coarse cattle drivers and used the term "cow-boy" as an insult. By the end of the 19th century, the cow-boy became the much more popular "cowboy," thanks in large part to the Buffalo Bill Wild West shows. The shows demonstrated bronco riding, roping, and other skills that would later become part of public rodeos. The Wild West was invited to England in 1887 to be the main American contribution to Queen Victoria�s Golden Jubilee celebration. "Buffalo Bill�s Wild West" was the hit of the celebration, visited by nobility, commoners, and by Queen Victoria herself. The show was credited with improving British and American relations. "Buffalo Bill�s Wild West" rose to international fame and returned two years later to tour the European Continent. Today there is a lot of confusion about the relationship between Buffalo Bill and the Indians. Cody treated his former foes with great respect and dignity, giving them an opportunity to leave the reservation and represent their culture when many were trying to destroy it. Wild West show posters frequently portrayed the Indian as "The American." Buffalo Bill stated in 1885 that "The defeat of Custer was not a massacre. The Indians were being pursued by skilled fighters with orders to kill. For centuries they had been hounded from the Atlantic to the Pacific and back again. They had their wives and little ones to protect and they were fighting for their existence." These are not the words of an arrogant and bloodthirsty Indian killer, a manner in which he is sometime incorrectly portrayed. Buffalo Bill had a great love and concern for people, particularly children. Many free passes were distributed to orphanages when the Wild West show came to town. He also was a champion of women�s rights, advocating equal pay and voting rights for women. The women in his show received comparable pay for comparable work to the men in the show. In fact, the women in the Wild West often out-rode and out-gunned the men. Certainly the most famous was Annie Oakley, nicknamed Little Sure Shot by Sitting Bull. In 1912 Buffalo Bill needed financing for his show and went to Harry Tammen of Denver for a $20,000 loan. In 1908 he had combined his show with Pawnee Bill�s under the title Buffalo Bill�s Wild West and Pawnee Bill�s Far East. In 1913 the combined show arrived for a Denver performance date at the time the $20,000 loan was due. To their surprise the show was seized by the sheriff�s and held to pay off the $20,000 debt. Since Cody did not have that much cash available at the time and Tammen would not extend the loan, Buffalo Bill�s Wild West and Pawnee Bill�s Far East was sold off at auction in Denver. Continuing to use the debt as leverage, Tammen then forced Buffalo Bill to appear in Tammen�s Sells-Floto circus. It was clear that had been his objective all along. In 1915, Buffalo Bill finally got out of his coerced agreement with Tammen. Buffalo Bill never retired, even though he had hoped to do so. He did two years of farewell performances while his show was combined with Pawnee Bill�s in 1908 but discovered at the end of the second year that he could not retire. Growing personal debts due to bad investments left him with little to retire on. Even after Cody left the Sells-Floto circus, his financial situation kept him performing with other wild west shows. In 1917 Buffalo Bill died while visiting his sister�s home in Denver. According to his wife Louisa it was his choice that he be buried on Lookout Mountain overlooking Denver and the Plains. Despite the claims of the citizens of Cody, Wyoming that he really wanted to be buried near Cody, close friends like Goldie Griffith and Johnny Baker, as well as the priest who administered last rites, affirmed that Lookout Mountain was indeed his choice. On June 3, 1917, Buffalo Bill was buried on Lookout Mountain, a promontory with spectacular views of both the mountains and plains, places where he had spent the happiest times of his life. Louisa, who had married Buffalo Bill back before he became famous, was buried next to her husband four years later. That year, 1921, the Buffalo Bill Memorial Museum was begun by Johnny Baker, close friend and unofficial foster son to Buffalo Bill. Just as millions of people saw Buffalo Bill in his Wild West shows during his life, millions of persons have visited Buffalo Bill�s grave in the years since 1917. Today it is one of the top visitor attractions in Denver and Colorado. Looking across the Oklahoma prairie, one can imagine scenes once visible to the people of the frontier: No Man's Land, Indian Territory, cowboys, buffalo, and the great rolling plains. No other Oklahoman exemplified "The Wild West" as did Gordon W. Lillie ...Pawnee Bill. He was born in Illinois in 1860 and became interested in the west as a child. He came to Indian Territory in 1875 and was appointed teacher for the Pawnee Indians in 1879. In 1883, Gordon W. Lillie joined thenewly formed "Buffalo Bill's Wild West Show" as an interpreter and performer. In 1886 he married May Manning, a 15 year old girl from Philadelphia he had met while traveling with the show. In 1888 Pawnee Bill formed his own "Wild West Show" and May became a very popular act in her own right for her marksmanship and riding. Pawnee Bill, always an entertainer and interested in preserving the Old West for future generations, built "Pawnee Bill's Old Town and Trading Post" two miles west of his buffalo ranch. This tourist attraction was complete with rustic cabins to rent, restaurants featuring buffalo steaks, Indian dancing, Indian tepees and mud lodges, and buffalo grazing in the background. It was the scene of many large statewide celebrations for the boy scouts as well as other organizations and famous people. Old Town burned to the ground in 1944 and with it some of the finest objects of Indian art and artifacts of the Old West were destroyed.